Even small helicopters are fiendishly complex, which makes them to expensive to buy and maintain. 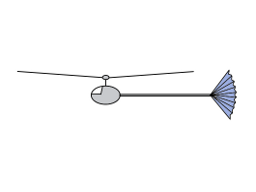 Today’s invention is one way to simplify light helicopters. When you open the throttle on the engine it exerts a torque on the main rotor and, with any luck, you gain altitude. The downside is that the airframe has a reactive torque act on it, so that it will tend to try to spin about the main rotor axis in the opposite direction. To counteract this and allow engine acceleration in forwards flight, helicopters are fitted with a tail rotor. Such a system is heavy and complicated. Imagine, by contrast today’s invention. It is modeled on an old-fashioned lady’s fan. This would be made of aerospace quality mylar and held between two thin plates, hinged so as to naturally spring apart. This assembly would be inserted into a light, box-section rear spar, as shown. During engine acceleration, the fan would be partly ejected from the spar(eg by a push-rod). It would spring open and limit rotation of the airframe by introducing an appropriate level of rotational drag (without introducing any extra drag in the forwards direction). Coordination of the inwards and outwards movement of the fan with throttle use would also facilitate changes of direction. An even simpler version would use the rotational flick of the airframe, on throttle opening, to slide the fan outwards automatically, in the manner of the original steam governor.